Back when I started the blog, this recipe was one of the first ones I intended to write up, but I wanted to wait until I had a photo to go with it. Then I proceeded to not make granola for about 4 years. 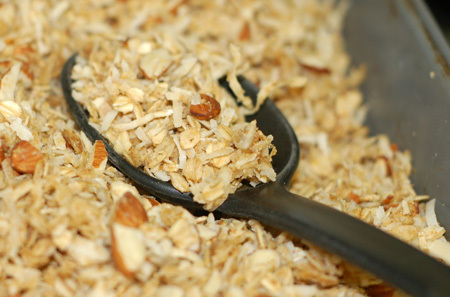 But the usual breakfast options were getting tiresome, so this afternoon I mixed up a big bowl of granola and let it slowly crisp up in the convection oven, filling the house with the fragrance of vanilla, almonds and coconut. It is delicious eaten like plain cereal with milk, scattered over a dollop of yogurt, or in pretty much any other application you can devise. This is not, however, a chunky granola, but rather a crisp, light one; if you want chunks, add a few extra tablespoons of water or juice, and press the mixture gently with your hands to form clumps. Like any granola recipe, you can easily adjust the flavor profile by using different nuts, seeds, spices, or juices, or mixing in dried fruit after the granola finishes cooking. This last time, I almost added a handful of buckwheat or mesquite flour in place of the wheat germ, and have used flaxseed or chia in the past; these options, along with carefully sourced oats, will give you gluten-free granola. I imagine you could also use honey or brown rice syrup in place of the maple syrup. Preheat the oven to 250 degrees F. Lightly grease a large cake pan with cooking spray. In a large bowl, toss together the oats, almonds, wheat germ, coconut, and sunflower seeds (if desired). In a separate bowl, whisk together the maple syrup, brown sugar, oil, water and salt. Pour the liquid over the oat and nut mixture, and stir until evenly coated. Spread out in the prepared cake pan. Bake for 75-90 minutes in the preheated oven, stirring every 15 minutes until evenly toasted. Cool, and store in an airtight container at room temperature.